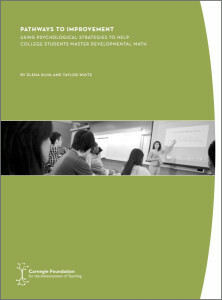 Many students enter developmental mathematics courses with a desire to learn and succeed; however, a large percentage of these students never complete their math requirement. Whereas some students withdraw effort soon after a course begins, many others do work hard — studying long hours, nights and weekends — yet do so with ineffective strategies. To help more students be academically successful, we want them to continue to persist when faced with challenges (tenacity) and to do so efficiently and effectively (good strategies). 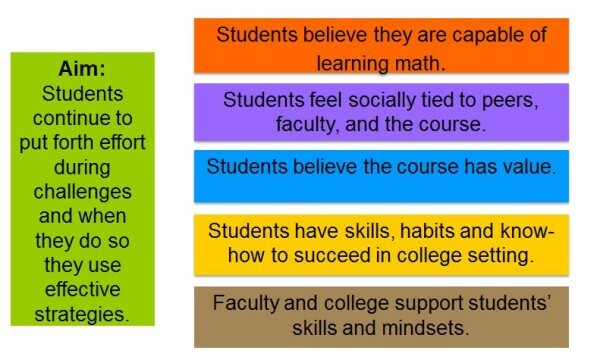 Productive Persistence is a key part of the Carnegie Math Pathways that focuses on addressing student beliefs about themselves as mathematical learners and doers, and their feeling of belonging in a mathematical environment. Starting with existing research, faculty and researchers within the Pathways worked together to design, test, and refine interventions to promote student engagement and success. Looking at the problem from the perspective of a student, faculty and researchers identified important psychological factors that drive student engagement and motivation. A list of hundreds of potential drivers was narrowed to a few that resonated with both practitioner experience and researcher expertise. A model was then “tested” and refined in discussions with faculty, researchers, college counselors, and students. In order to combine the views of practitioners and researchers into a shared “theory of action,” we developed a common framework that guides innovation, development, measurement, and improvement efforts around drivers of student engagement and motivation. Defining and improving Productive Persistence within the Carnegie Pathways is the result of an ongoing partnership where faculty regularly team up with leading psychology professors to combine academic research with practitioners’ expertise. Working together as part of a Networked Improvement Community, Pathways faculty and leading researchers continue to design, test, and adapt promising ideas to address the needs of students taking developmental mathematics. Aided by researchers and Carnegie staff, faculty utilize Pathways student data to build an evidentiary basis for scaling potential psychological interventions to all Statway and Quantway classes.